Venezuelan Henry Damon has long admired Marvel's Red Skull, the archnemesis of Captain America - and he's chosen to display his love for the character through extreme body modification. Warning: There is a picture and footage of the modification after the cut, and it's graphic, so proceed with caution. 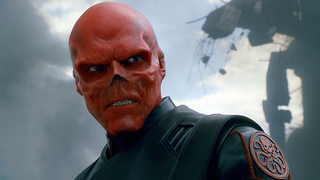 Damon's journey to becoming the Red Skull isn't over - aside from planning to get his face tattooed all over to emulate the Skull's red colouring, he also intends on getting more sub-dermal implants in his cheeks and chin to complete the look.